The Berylas Laser System is the newest Class IV laser available in the medical marketplace today. It includes the optimal range of wavelengths. The active medium of the diode laser is a solid state semiconductor made of aluminum, gallium, arsenide, and occasionally indium, which produces laser wavelengths, ranging from approximately 810 nm to 1920nm. All diode wavelengths are absorbed primarily by tissue pigment (melanin) and hemoglobin. Specific procedures include aesthetic gingival re-contouring, soft tissue crown lengthening, exposure of soft tissue impacted teeth, removal of inflamed and hypertrophic tissue, frenectomies, and photostimulation of the apthous and herpetic lesions. Laser light is a monochromatic light and consists of a single wavelength of light. It consists of three principal parts: An energy source, an active lasing medium, and two or more mirrors that form an optical cavity or resonator. For amplification to occur, energy is supplied to the laser system by a pumping mechanism, such as, a flash-lamp strobe device, an electrical current, or an electrical coil. This energy is pumped into an active medium contained within an optical resonator, producing a spontaneous emission of photons. Subsequently, amplification by stimulated emission takes place as the photons are reflected back and forth through the medium by the highly reflective surfaces of the optical resonator, prior to their exit from the cavity via the output coupler. 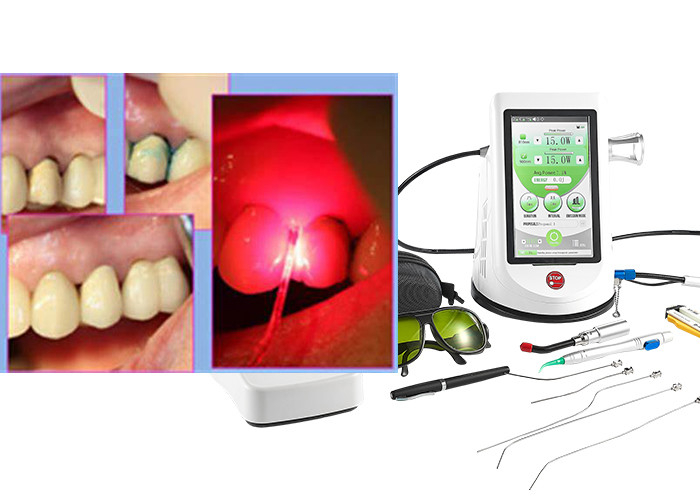 In dental lasers, the laser light is delivered from the laser to the target tissue via a fiberoptic cable, hollow waveguide, or articulated arm. Focusing lenses, a cooling system, and other controls complete the system. The wavelength and other properties of the laser are determined primarily by the composition of an active medium: solid-state semiconductor. 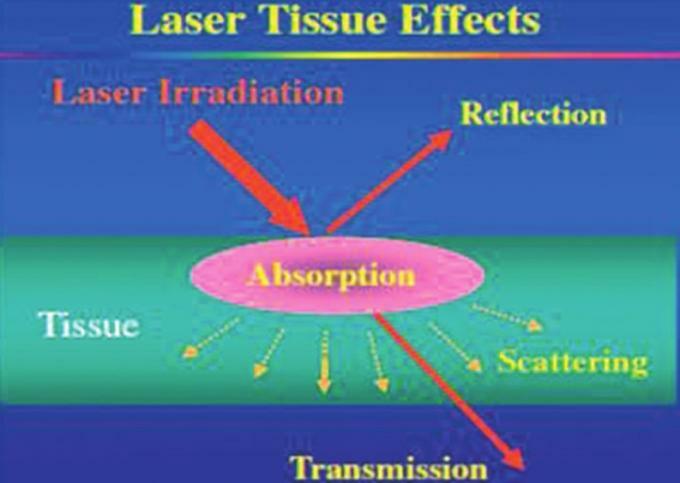 The light energy produced by a laser can have four different interactions with a target tissue: Reflection, Transmission, Scattering, and Absorption . When a laser is absorbed, it elevates the temperature and produces photochemical effects depending on the water content of the tissues. Absorption requires an absorber of light, termed chromophores, which have a certain affinity for specific wavelengths of light. The primary chromophores in the intraoral soft tissue are Melanin, Hemoglobin, and Water, and in dental hard tissues, Water and Hydroxyapatite. Different laser wavelengths have different absorption coefficients with respect to these primary tissue components, making the laser selection procedure-dependent. 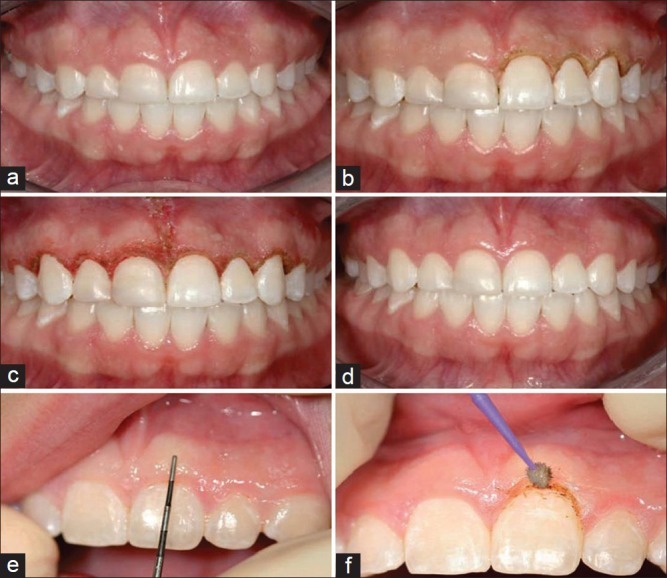 With the advent of the diode laser, many clinicians are choosing to include optimization of gingival aesthetics as part of the comprehensive orthodontic treatment, whereas, conventional gingivectomy is associated with pain, discomfort, and bleeding. Isolated areas of transient tissue hypertrophy can easily be excised with the diode laser without specialist referral The diode laser is also very useful for a number of isolated applications, such as, removing tissue that has overgrown mini-screws, springs, and appliances, as well as for replacing a tissue punch if needed, when placing mini-screws in the unattached gingiva.